Suria was a 38-year old man from Indonesia. He came to Penang for his wife’s operation but instead found himself to be suffering from liver cancer. For the past 20 years he had gastric problems and since the last ten years he had blurry visions. His daily diet: ayam goreng (fried chicken). A CTscan of the liver dated 2 March 2001 indicated a lobulated mass seen in the left lobe of the left liver. This possibly represents a hepatoma. The small nodular lesions seen in the right lung possibly represent metastatic lesions. Suria came to see us on 13 March 2001 and decided not to undergo chemotherapy. He was put on Capsules A and B, Liver P and LL-tea. He returned to Indonesia. After two months he came back again and reported that he was doing well but was bothered with our recommendation to abstain from meat, oil, salt, dairy products and sugar. We were indeed surprised to see Suria in Penang again on 26 August 2001. After talking to him for a while we felt really sorry for him. He could only give us an anguished laughter once in a while. We also felt sorry for his small daughter and young wife who accompanied him on this trip. The short sad story went like this. On his return to Indonesia, he started searching for a cure for his liver cancer. He went to see a doctor in a Jakarta hospital who then referred him to a specialist inSingapore for further treatment. Suria had a part of his liver resected on 5 May 2001 in Singapore. Before the operation, the surgeon told Suria that he had a 98% chance. Unfortunately, this assurance was misleading. 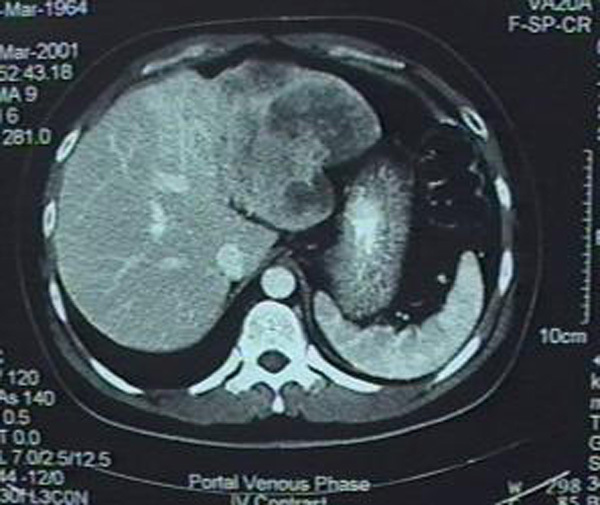 Barely three months later, scan done on 21 August 2001, showed that there were at least two space-occupying lesions in the liver, the configuration of which would be compatible with the presence of metastatic disease. There were also multiple small pulmonary nodules seen in the lung bases on both sides consistent with metastatic lung disease. The surgeon was unable to help Suria anymore. The 98% chance of success he gave to Suria was meant to be a guarantee that Suria would not die because of the operation, but it was NOT a cure or non-recurrence of his liver cancer. The doctor washed off his hands from this case and referred Suria to an oncologist in a university teaching hospital. Suria then met up with the oncologist and was given the obvious answer: Go for chemotherapy! The following are excerpts of our conversation on that sad day. I had the tumour in my liver resected. Three months ago, on 5 May 2001. After I came to see you and took the herbs, I went back toIndonesia. Then I went to see a doctor in Jakarta. The doctor in Jakarta told me that the lump was getting bigger. If I were to get it resected, I would have more chances and can live longer – ten or more years. If I did not go for an operation, I would have no chance at all. So he referred me to a surgeon he knew in Singapore. When you were in Indonesia and were on the herbs, were you alright? Yes. I had no problems. I could eat. I could sleep. I could work. I was fine. It was just that the doctor in Jakarta said the lump was getting bigger and I should get it resected. The operation in Singapore, how much did it cost you? Before the doctor performed the operation on you, what did he say to you? Can you be cured or not by the operation? Hejamin me (Indonesian word for guarantee) that I had a 98% chance. After he operated on me, he told me that from what his eyes could see, everything was clean and clear. I should be OK. But he added that he would not be able to say for sure if the cancer would not recur. What did you think the surgeon meant when he said he gave you a 98% guarantee? My understanding was that I would be cured. That was what I thought all along. Now the doctor pusing sedikit (twist a bit) and told me that he only guaranteed 98% that the operation would be successful. But he only told me all this after he had operated on me. Three months after the operation, you came back for a check-up? Yes. I just went for the check up and had this CT scan done. After that I came to see you. When you went to see the surgeon again, what did he say? He said nothing. He just referred me to an oncologist in the university. What did the oncologist say? He asked me if I would like to take oral drugs for four weeks and see if they were effective or not. If the drugs were not effective, I should go for chemotherapy. Did he tell you that the lumps have already come back to your liver? He told me something like that. (Suria was probably not told or aware that the cancer had also spread to the lungs). Do you want to go for chemotherapy? No. I don’t want to do chemotherapy. When I first came to see you I had already decided that I did not want to do any operation or any chemotherapy. Then, why did you change your mind? When I came to you and you gave me your herbs you told me not to eat meat, no oily food, no dairy products, no salts and no white sugar. I didn’t like that. So, when the doctor said I can eat anything I like, I preferred to go for medical treatment instead. Oh, that was the reason? Yes, yes. The doctor said I can eat anything I like. Now Suria, you misunderstood me. Your diet has nothing to do with my herbs. The diet has everything to do with your liver cancer. Even if you do not take my herbs I would still advise you to keep to a good diet and abstain from all kinds of bad food. This is because of your liver cancer, not my herbs. If you are on my herbs and you still take bad food, you will not drop dead. You will be wasting your effort, your money and my time. So, the strict diet I ask you to adhere to is for your own good and for your liver cancer. We felt really sad for Suria. We wonder how often and how many of such tragedies happen in this world? Where is truth, where is fairness? Rabbi Harold Kushner (in Living A Life That Matters) wrote that we live in the world of two opposing moralities. There is the morality of cleverness and wit, in which success means getting the better of the other person by means of a slick business deal or a clever answer … Then there is the morality of righteousness, in which the highest good is thoughtfulness toward others. The worst sin is hurting another person.